Modular homes: These are pre-fabricated homes that are transported in pieces and constructed (or put together) by contractors at the site. These homes are usually assembled to a permanent foundation. 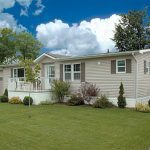 Mobile or manufactured homes: These are homes that are constructed entirely in a factory and are fixed on a permanent steel chassis. They are towed to the site, and are not attached to a permanent foundation. They can also be recognized by a HUD tag. Once you have determined which type of home you have, you can then begin with the policy that best fits your needs. Generally, a modular home can be insured under a homeowner policy. While a mobile home or manufactured home will require a policy for mobile/manufactured homes.